It seems like Nick’s entire family was born in December! In the first two weeks of this month, we celebrated 5 family birthdays– including Nick’s. That’s a lot of partying. Nick’s grandma was celebrating a milestone birthday this year– 80 years young!– so the family arranged a big party for her and all her friends. A few of us were in charge of the dessert table, and we decided on a red and white theme. There were a lot of red velvet ideas being thrown around, so I decided to mix it up a bit and take the peppermint route! Not only was peppermint perfect for the red and white theme, but it’s also perfect for the holiday season! Peppermint is by far my favorite holiday flavor. It definitely beats eggnog and even–dare I say– pumpkin. Exhibit A: Candy Cane Hershey Kisses. Seriously. Have you had these? They are my favorite thing ever. 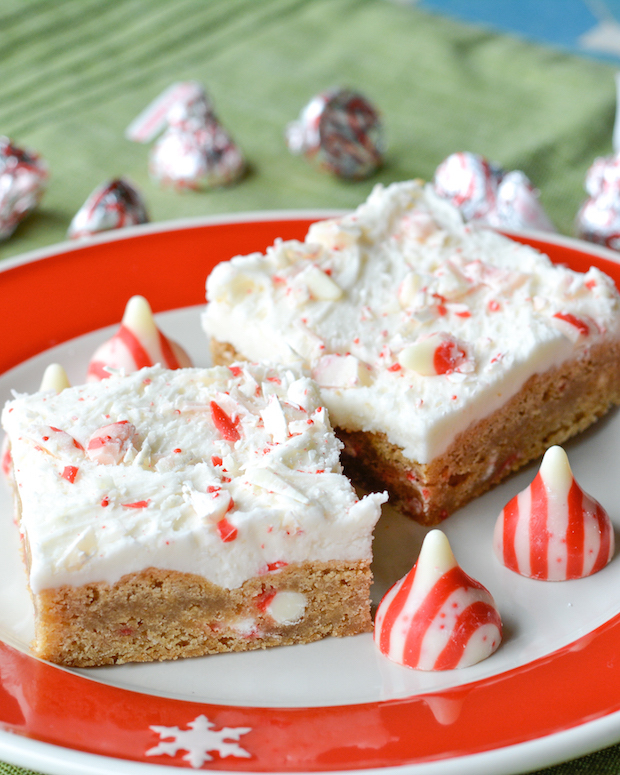 White chocolate peppermint– like the best part of the peppermint bark. I love them. Love love love them. So much in fact, that I’ve already bought 4 bags this year (which doesn’t include the ones we have at the office, which I have obviously partaken of). In an effort to introduce others to these little morsels of heaven, I decided to shove them in my baked goods. And on top. Because you can never have too many Candy Cane Kisses! Preheat oven to 350 degrees. Line a 9 x 13 inch pan with foil, then spray with nonstick spray and set aside. In a small bowl, whisk together flour, salt and baking soda. In a large bowl (or the bowl of a stand mixer), beat together butter and sugars with an electric (or stand) mixer. Once combined, add the eggs and peppermint extract and beat together. Add half the flour mixture to the wet ingredients and mix until incorporated, then add the other half and mix until combined. Fold in 1¼ cups of the candy cane kisses. Spread the batter evenly in the pan. Bake about 24 minutes, until edges are golden. Remove from oven and let cool in pan about 15 minutes. Then, with the help of the foil, remove from pan. Cool completely on a wire rack before frosting. To make the frosting, whip the butter with an electric mixer until fluffy. Add half the powdered sugar and beat until incorporated. Add the remaining sugar, milk and peppermint extract. Beat until fluffy. 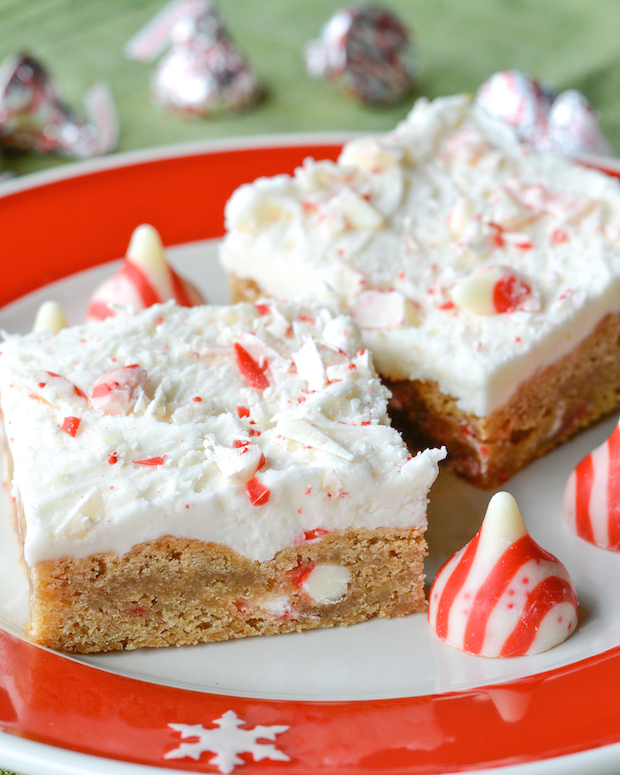 Frost the blondies, then sprinkle the remaining candy cane kisses over top. Cut and serve! These blondies were melt in your mouth delicious and super decadent with the thick layer of frosting. To be honest, the blondies would be perfectly sweet and delicious naked, without the frosting. But… ’tis the season of desserts and diet-busters, so… why not? For more candy cane fun, check out these Candy Cane Cookies I made a couple years ago! And if you love peppermint as much as I do and need even more inspiration, check out some of these other great recipes from some of my favorite bloggers! Five birthdays in one month?! That’s a lot! I have to say I think peppermint is one of my top favorite holiday flavors too. I love the all of the frosting on the blondies too, so fun and festive. Candy cane hershey kisses are my weakness, Jess! They are so addicting that I just can’t keep them in the house! These blondies look amazing! I’m loving that thick frosting on top. Such a delicious dessert! Pinned! And hope you have a wonderful Christmas! I love those Candy Cane Hershey Kisses, Jess! I’m with you – I could eat a dozen bags of these! And these blondies look like the perfect thing to put them on! Have a very Merry Christmas! These blondies look perfect, Jess! I absolutely love all the crushed candy canes on top—so gorgeous! So gorgeous and so YUMMY!! 🙂 Thanks! How fun for the season to pick red and white. These look so fun! I bet everyone enjoyed them. Oooh I wish we had those cute Candy Cane Kisses here! They look amazing! And WOW, so many birthdays to celebrate right before Christmas, that’s a month pretty big on the parties 🙂 Love those bars, they look so delicious Jess! I hope you had a lovely Christmas and a very Happy New Year to you and your family!